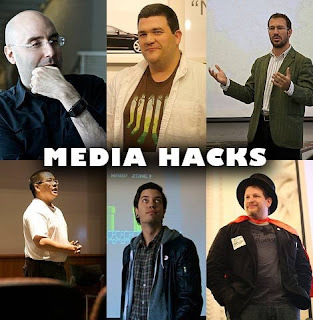 Thought leaders such as Mitch Joel, Chris Brogan, CC Chapman, Julien Smith, Hugh McGuire, Christopher S. Penn and numerous others have stepped up with a necessary initiative called Media Hacks. This is an open discussion about digital space, social media, marketing and anything else that comes up. Mitch talked about it this past weekend on his Six Pixels of Separation podcast. The idea is to gather thinkers and share ideas, no rules, opinions are allowed and encouraged. And it’s absolutely free. The magic of this initiative is that others will be invited to contribute to the conversation. That is the essesnce of social media – you can have information and thoughts from leaders in industry and they want to hear yours. The Media Hack blog and podcast is coming very soon. If you have an idea, start sharing!